Compact and efficient All-Wheel-Drive front mower for year-round maintenance in complex and narrow areas. Suitable for sport clubs and hotels as well as housing agencies and contractors who want a versatile, compact front mower that is highly manoeuvrable. Thanks to the front-mounted cutting deck the operator has a perfect overview of the working area. This means optimised trimming ability as well as accessibility under benches, bushes etc. Increased durability through long-life components. Attachments such as flail mower and broom give increased productivity all-year round. *The P 524 is delivered deckless and can be fitted with 112 and 122 cm Combi cutting decks. 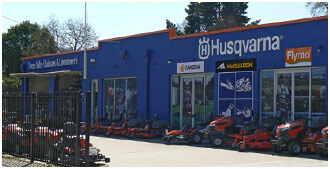 Snow thrower, folding plough & snow blade attachments not available in AU/NZ markets. *Decks supplied at additional cost. High-capacity diesel-powered front mower offering unbeatable manoeuvrability and productivity in complexes and narrow environments as well as in larger-sized areas. The commercial grade transmission gives uncompromised traction and slope stability. The machine’s compact size and high ground speed makes it suitable for municipalities, contractors, housing agencies etc. Thanks to the front-mounted cutting deck the operator has a perfect overview of the working area. This means optimised trimming ability as well as accessibility under benches, bushes etc. Long-life components for solid durability and less downtime. Attachments such as flail mower and broom give increased productivity all-year round. *The P 525D is delivered deckless and can be fitted with 132 and 155 cm Combi cutting decks. Optional cabin, snow thrower, folding plough, snow blade, not available in AU/NZ markets. *Decks supplied at additional cost.